The SIL Tai Dam Fonts are regular and bold versions of the traditional Tai Dam script and are closely based on handwritten letters. The fonts are available for both Macintosh and Windows systems and include keyboard definitions. Over half a million Tai Dam people (also known as Black Tai or Tai Noir) live in northwestern Vietnam and northern Laos. Their language is a member of the Tai-Kadai language family and is closely related to Laotian and Standard Thai. 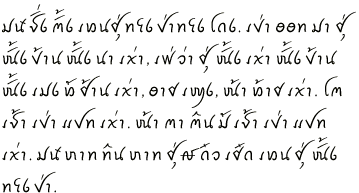 The Tai Dam have a long tradition of literacy in the script rendered by the TaiHeritage font family. 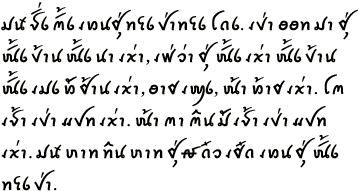 In more recent years, other orthographies, including romanizations, have come into use as well. Special thanks are due to Mr. Faah Baccam, whose drawings have served as the basis for the development of these fonts. Any defects in the final digital designs, however, remain our responsibility. Suggestions for design improvements in any future edition, especially from Tai Dam users of the fonts, are welcome. SIL International (SIL) is an organization of linguists dedicated to the study and promotion of the thousands of languages around the world. SIL’s International Publishing Services serves SIL by developing products to assist in the publication of linguistic texts.